Well, as usual it has been a busy few days. I seem to spend my life in a perpetual whizz! Everything that needs to be done gets done somehow and there is always a method to my madness!!! It was fantastic Silver Quay, winning at Taunton, his owners the Jones family are great owners and enjoy their racing so much. Win, lose or draw as long as he is happy, safe and doing his best they just love being involved with racing. Quay has had extensive physio, it took us a while to work out the physical issues he had when he arrived here. None were huge problems, but it can take time with some horses to get the whole body sorted! His, great attribute is that he loves his work and he tries hard. On Sunday, the yards were going well. The horses left for the races and I went back up to the yard to put their boxes straight for when they came home. Lucky I did, I had wondered where Barley, my rotund yellow lab was, he is normally at my side constantly. But I carried on and went to tip my wheel barrow and there at the bottom of the very large trailer was dear old Barley, looking up at me as if to say, “Whoops! Sorry Mum, but I think I may have made a bit if a boo-boo! Can you rescue me…preferably without letting the rest of the pack know?” This was easier said than done, he weighs more than I do, and it was a long way up to the ramp! But we had a cunning plan, I could use one of the planks that are still lying in the yard for the new stables. After choosing a suitable one I managed to slide it down into the trailer and began to encourage Barley to scramble up! Well, he just looked at me apologetically as if to say “No way, that’s not going to work!! !” So, we had to re-think, eventually I came to the conclusion there was no option other than to jump in. He, to his eternal loyalty tried his best, doing little jumps as I lifted and pushed upwards. I’m not sure how long it took us, and I was very grateful nobody was watching, after lots of huffing and puffing and a lot of laughing at our predicament we scrambled out! He was thrilled and ran around with true Labrador joy happy that he had been released from his rather embarrassing situation. I was very lucky mid-week, when I had some time to get in the garden to do some tidying up. I have to admit the weather was so lovely, bright sun shine, it almost felt spring like. I had to keep reminding myself not to get carried away, we must be due some winter weather at some point. Hadden and I had started an area in the garden that we hope to be a wild garden. I introduced several wild flowers last year, hopefully, we will see that planting come to fruition. It all looks very good, the bird boxes are up and the log pile looks as if it may be occupied. I have found lots of wild seed, all bee/insect friendly. I was so tempted to sow them but resisted reminding myself again of tales of snow! I did, however, re-discover my rose bed! That has now been tidied and generous amounts of “go faster, race horse dung” has been administered! I was reminded that some of the roses were actually given to Jim, for his 50th birthday it seems crazy, he celebrated his 60th, this summer. These poor Roses have just been doing their own thing really, without much help from me! A new horse arrived this week, a mare she is called Summons to Court. She seems very sweet, she has settled in well and is fit, all she needs is an owner and she’ll be away. Saturday was amazing, The Cheltenham Trials Day. There was a lot of hype and analysis before Frodon’s, race. Everybody seems to have an opinion, the more I read the more I got nervous. Bryony thrives on it, all jockeys want to be riding in these big races and with them comes the press coverage. We rushed around all morning, getting all the yard work done. I had a pointer running on Sunday, so he needed exercising and bathing ready for that. Jim had suddenly decided he was going to go to Cheltenham, all very last minute but a quick shower and change off he went. Dan and I came in from the yard and set about lighting the fire and settling down to cheer B on. It was very in-considerate weather here. For anyone who has ever been with me when I’m watching a race will know I am in fact not a watcher!!! I am a pacer! With the rain on Saturday, my walk around the house, listening to the commentary booming out of each end of the house was testing! As the race nears its conclusion I pluck up my courage and come into the house to watch the last couple of fences and shout her home… which I’m sure really makes a difference? Still, if you don’t excite about watching fantastic racing I’m not sure what else there is? Over the years of watching Jim, Hadden and now B, I don’t seem to be any better at it! It isn’t just whether they win, with Hadden and B, they have both always been desperate to ride well in all the disciplines, from the 12hh show pony to the JA show jumping pony to pony racing, pointing and so on. It is part of being a professional rider, they feel as long as they have ridden that horse to give him as much guidance and help as they can, they have avoided making mistakes and given him the best possible chance of winning that is their job. I can remember, very often when B had competed with her ponies, she would come back to me at the ring side and a thorough analysis would take place, she would question everything. 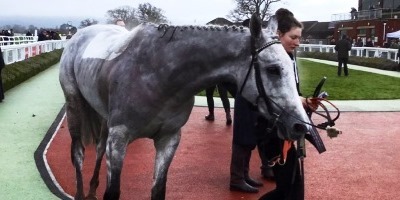 The same goes on now, she watches the replays, not through being vain about winning a race but purely to get every detail, to remember and take note of her horse and all the others that she will be likely to meet again soon. I think from a parent’s perspective, you just want your children to be happy and winning makes Bryony happy! The point-to-point on Sunday went very well apart from reports of a power line down and a detour in place. That would have been fine if the signs had not all blown over! We had a very leisurely morning at home, thinking we had one runner and he wasn’t until 3.30pm; my brother was staying with us visiting from Spain. So, we all enjoyed a fry up and then said our good byes until next time and off we went! As we got nearer to the meeting there was a minor panic about how to get there! Thank goodness for satnav, it took us down some pretty narrow roads and avoided rail bridges, we arrive! Our lorry does not do mud? As usual we gave it a go and slithered to a halt, awaited big tractor, we got hitched up and towed to our spot for the day. Sleet, snow and a bitter wind were the order of the day. I’m ashamed I did sit in the lorry a lot, shivering watching poor horses being washed with cold water after they had run! The thought of having water thrown all over you when it is so cold makes me go into a hypothermic quivering mess!!! I really don’t do cold very well a real wimp? I will end now, I’m sure I have waffled on for long enough. Hope to see you soon. Best wishes, Nikki.